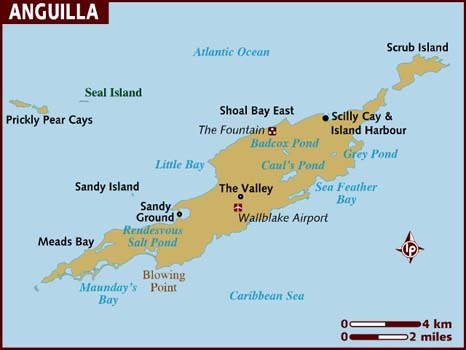 Anguilla, a British Overseas Territory in the Eastern Caribbean, comprises a small main island and several offshore islets. It is one of the most northerly of the Leeward Islands in the Lesser Antilles, lying east of Puerto Rico and the Virgin Islands and directly north of Saint Martin. The territory consists of the main island of Anguilla together with a number of much smaller islands and cays with no permanent population. Its white, powdery sand beaches stretches for miles. Swim and sunbathe all day—and all year round—at romantic public beaches like the aptly-named Rendezvous Bay, then dance to calypso music at Anguilla’s annual summer festival. Other beaches are located on secluded coves reached by boat, such as at Little Bay. Protected areas include Bit Spring Cave, known for its prehistoric petroglyphs and East End Pond, a wildlife conservation site.